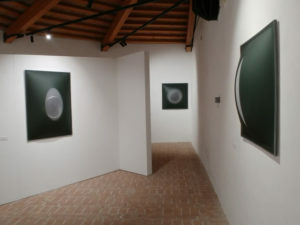 Inaugurated on Friday, July 20, 2018 in the spaces of the Center for Contemporary Art of the Rocca of Umbertide and curated by Giorgio Bonomi, Two Artists – One Exhibition is the synthetic but eloquent title of an exhibition that looks like a double-personal show, able to skilfully arrange in the same exhibition itinerary the artworks of Emanuela Fiorelli and Paolo Radi. Authors of different languages in the aesthetic outcomes, it is possible to see how, thanks to a congenial preparation distributed on the three floors of the ancient building, this diversity does not generate dissonances but, on the contrary, ends up establishing an original and constructive dialogue. It becomes easy to perceive how the exhibition, confirming the words of the curator “offers different but harmonious and non-contrasting visions”, making the observer understand how the style of the two interpreters, even in evident dissimilarity, can be complementary. 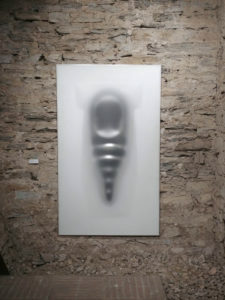 In fact, both artists reason in abstract and aniconic terms, putting under their own magnifying glass the minimal and silent aspects of the visual experience, using in their research disparate materials and so arriving to put in crisis the border between sculpture, painting and wall artwork. Fiorelli, with her Sculptureboxes, does an investigation on the orthogonality of the optical and objective possibilities of the surface, about its implications and the technical means employed, valorizing its dynamic potential together the spatial and physical components where the tarlatana network measures itself with the joints of the cord on canvas, arriving so to show ever diversified conjugations in addition to the high degree of tension verifiable in artworks like these. Radi, with Visibile Provvisorio, offers a series of creations characterized by soft and protruding shapes, mainly in tones of white, gray and black, obtained also thanks to PVC and perspex, where the artist practices a language without superfetations, for the benefit of a register made of convex surfaces that, thanks to the refined use of gold and silver, seem to have their own brightness and transcend the physical boundaries of the support. 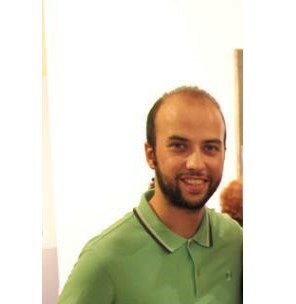 The two artists, each one personally, seem to reflect on the fundamental narrative qualities of the work of art, thus working on the concepts and implications of superficiality and depth, space and light, static and dynamic vision; demonstrating with the pieces selected as both are looking for the same sensitivity, but facing it from different directions of meaning. Visible until September 16, the exhibition, organized in collaboration with Galleria FerrarinArte of Legnago (VR) and Kromya Art Gallery of Lugano, with Giorgio Bonomi as the curator, helps us understand – thanks to the example provided by the elaborations of Emanuela Fiorelli and Paolo Radi – how the meaning of surface is today characterized by a certain variability and how it is far from the most common conceptions of flatness and two-dimensionality.